Back in the day, when people wanted portable music, it usually meant using a giant boombox loaded with C or D batteries. These devices offered the ability to play AM/FM radio, cassette, and later on, CD too. The included carry handle allowed the owner to easily take it to places like the park or the beach. Heck, some people walked around with it on their shoulder blasting music on the go. Nowadays, boomboxes have largely been replaced by small Bluetooth speakers and smartphones. JBL seems keen on resurrecting this product type, however, with its all-new "Boombox." This is a very large Bluetooth speaker with integrated carry handle, that promises exceptional bass. There are no C or D batteries here, however, as it has a massive rechargeable 20,000mAh battery which can provide up to 24 hours of music playback! That large battery can be used to charge other devices too, such as smartphones and tablets. You can even pair two Bluetooth devices simultaneously. "The newest member of the JBL portable speaker family delivers a serious punch while setting a new benchmark in party sound via Bluetooth streaming. It's also the biggest portable speaker available, weighing in at over 11 pounds (5.25 kg) and nearly 20 inches (50 cm) long. The speaker’s large frame is equipped with four active transducers and two bass radiators, providing powerful sound and bass in a substantial -- but portable -- package," says JBL. The company also says, "The portable speaker also features an IPX7 rated waterproof design. Whether stopping by a legendary pool party, shooting hoops with friends, or hitting the beach, the Boombox is rugged enough to withstand any weather conditions. 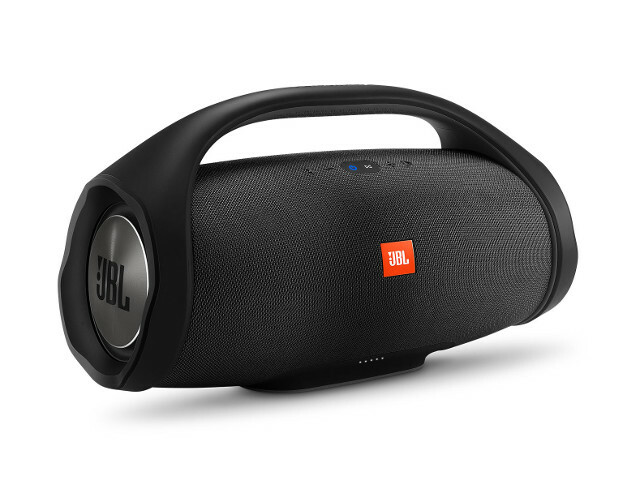 For those looking to make the party even bigger, the Boombox can connect to more than 100 JBL Connect+ enabled speakers within Bluetooth range, taking the sound experience to an entirely new level with a touch of a button." The beautiful JBL Boombox can be had in the fall -- the company does not yet have a more definitive date. The timing should make it an ideal holiday gift. It is not an affordable affair, however, as it will cost $450.